Following all the trades that Jerry DiPoto has made so far this offseason, his first with the Seattle Mariners, it appears that a trade of Mark Trumbo could be next up on the list. The Mariners have clearly taken a new approach at making their defense better and their offense less one-dimensional. Trumbo represents all of the bad of the last regime in Seattle. Trumbo plays mediocre defense, has a low on base percentage, and is really only useful for his power potential. Add that to his projected $9.1 million salary for 2016, and Trumbo is clearly expendable this offseason. Moving Trumbo also frees up the potential for Nelson Cruz to play first base next season, which would further solidify the Mariners defense. The Mariners also could use the money saved from a Trumbo trade and pursue further outfield upgrades. All around this trade makes complete sense for the Mariners, and it must happen this offseason. The Reds clearly are in need of a rebuild, or reset, or whatever it is general managers are calling it these days. That all starts with trading Aroldis Chapman at the earliest possible chance. In all honesty, the Reds probably should have pulled the trigger on trading Chapman at last year’s trade deadline while his value was even higher. With that being said, Chapman is entering his final year before free agency, and the Reds need to trade him as soon as possible. Chapman is arguably the Reds best trade piece, and they will never get as high of a return for him as they well this offseason. The Reds need to get younger and acquire more depth in their farm system. Chapman is the starting piece to that process. 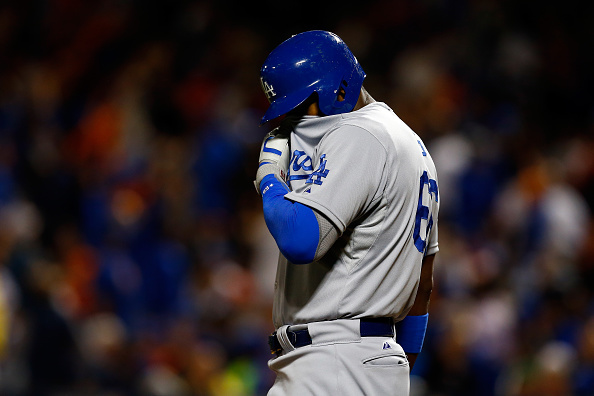 Once again, the Los Angeles Dodgers came short of making it to the World Series. Once again Yasiel Puig was a spectacle and a distraction off the field. The rumors have ramped up in recent months, with many calling for Puig’s trade, with some within the organization even advocating for a trade. Puig still has several years of team control left and would certainly garner the Dodgers quite a good return. Right now the Dodgers need to focus more on improving their team on the field, and Puig is nothing but a distraction from that goal. With the most recent incident of a bar fight, Puig has arguably finally worn out his welcome in Los Angeles. The Dodgers must cut bait on the much maligned outfielder this offseason. Another player that has worn out his welcome with his current team is Marcell Ozuna of the Miami Marlins. Following a poor start to the 2015 season, a demotion to Triple AAA, and conflict between Ozuna’s agent and the front office about Ozuna’s playing time, it appears that the front office has made it very clear that they do not want Ozuna playing in Miami next season. Given his age, he is only 25 years old, and his team friendly contract, Ozuna should still get the Marlins quite a return even with his struggles in 2015. Ozuna still has a relatively large upside long term and should net the Marlins a decent return. The Marlins have made it clear they want young, controllable starting pitching in return if a trade is to happen and it should be their goal to make it happen this offseason. Of all the players on this list, Tyson Ross is the only player who does not come with contract concerns or question marks about on field, or off the field, performance and attitude. Ross had the best season of his career in 2015 and has a higher value now than he probably will ever have. The Padres are in a sort of quasi-rebuilding mode currently, and with an almost barren farm system, it would make sense for the Padres to trade Ross for younger talent. Ross is by no means an expendable piece and would definitely be a loss for the Padres, but he isn’t getting any younger or any cheaper in the coming years. Ross represents a cheap alternative to the many expensive starting pitching options on the free agent market, and the Padres can demand a substantial return in any trade. A.J. Preller should do everything he can to make that happen this offseason. Next Next post: Writer’s Roundtable: What one offseason move would you like your favorite team to make?